Power Acoustic/Modern Rock - Powerful, lyrical, sarcastic, insightful. Propelling acoustic guitars into a different universe. Since its original formation in 1996, Friday's Child has continued to defy any boundary or category in the music business. Tom Walker, front man for the band, put Friday's Child on the map through a continuous tour of clubs, colleges and in-store performances at Borders Books and Music Stores all over the country. Listed under its own genre, Power Acoustic, Friday's Child's iconoclastic presence in the market has made the band a benchmark in the Indie music world. Ignoring the conventional music business, Friday's Child focused the majority of its resources on creating a large Internet audience and constant touring. The band innovated the most coordinated national café music store tour of the Borders chain ever conceived by an Indie band. It lasted 7 years and made the band one of the best-selling Indie bands in the country. Friday's Child was voted Best Rock Band by millions of surveyed Internet radio listeners worldwide, with three songs tied for number 1 in the Rock category for two years running. Tom's savvy guerilla marketing techniques led Friday's Child to be featured in the best-selling book, "The Real Deal: How to Get Signed to a Record Label," by Daylle Deanna Schwartz. 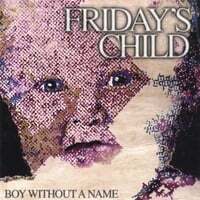 Friday's Child was also one of the first Indie bands to focus most of their marketing efforts to on-line audiences. The band has hosted panels Internet Music Marketing, promoted events, and showcased on at major music festivals such as CMJ, Atlantis, and The Folk Alliance. The original incarnation of Friday's Child disbanded in 2003. Tom re-formed Friday's Child with his new production partner/bassist, Rich Haddad and recorded the 2005 studio release, "In a Word." Rich's understated bass playing and clear voice formed the core of the band's new sound. Joined by drummer, Rob Grosso and Tom's childhood guitar mentor, Don "The Professor' Regan, the new Friday's Child took the stage at Summer NAMM 2004, showcasing for a few of the band's instrument sponsors. At the end of 2005, Friday's Child partnered with Brian Jude of Dragon Rider Productions to recorded a concert DVD called "Live at Luna Stage." The first edited clips of the show were very powerful and reached a large, devoted on-line audience in a very compelling way. At the same time, the band noticed that they were outselling their own CD's with their own digital downloads. Friday's Child re-focused its efforts to capturing any and all live performances on audio and video as a new form of syndication called Indie-cation. Gathering a marketing collective of Indie artists, The Digital Café Tour, LLC was born. Shooting from May to December in 2006, DCT aggregated 60 hours of concert and “Broaden Your Band” instructional documentary footage. Visit www.digitalcafetour.com to view sample clips from DCT’s series. Friday's Child is proud to welcome Surrey Lane's Kevin Jahoda on percussion. Kevin debuted with the band on Dec. 7, 2006 at The Cutting Room. He is a welcome addition to the lineup.